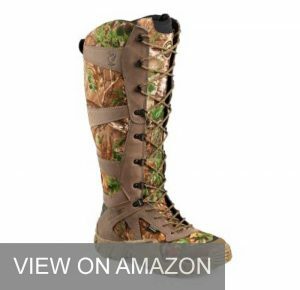 The Danner Pronghorn Realtree Xtra are listed as men’s boots but could be worn by women with large feet. Strength and comfort-wise, this is as good as it gets. You can wear them in heavy downpours and never have a drop enter underneath the tongue; water just beads off quickly without absorbing in the material. The tread is very powerful and doesn’t peel when walking on rough and uneven surfaces. You may even be tempted to wear them casually, as they don’t produce sweat or moisture around your feet at all. 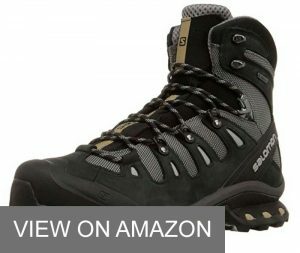 In short, the Pronghorn Xtra is the best pair of boots shown on the list, hands down. 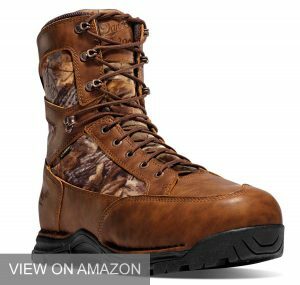 The Irish Setter Vaprtrek is a boot for the avid outdoorsman. You can tell just from its shape and color that the brand is serious about their product. 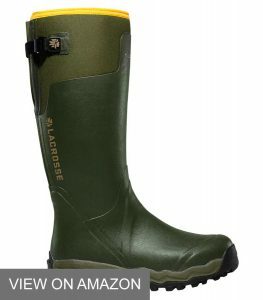 The shaft and ankle support are probably one of the best to be found of any waterproof boot in retail; you’ve likely never experienced this level of comfort in hunting attire before. When you need to get through large areas of water without having your feet turn into soggy sponges, the LaCrosse Alphaburly Pro is the right pair for the job. It’s entirely encased in layers of rubber and synthetic material, having a tall shaft that extends well past the ankle. You can take them on or off easily without trouble, which is surprising due to its shape. Just be careful how you walk in them, especially if the surface you traveling on is uneven and jagged. They scratch pretty easy and may lead to holes if you’re not careful. Recommended for snowy and/or swampy environments. 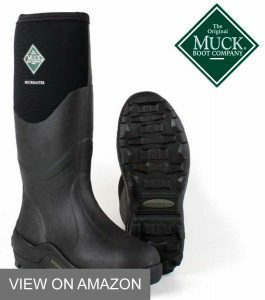 The Muck Boot MuckMaster is another high-top waterproof rubberized boot for those living in areas with a high rate of precipitation, but these have one advantage that’s often seen in leather boots. It’s the steel toe and toe box. The material is extremely hard and dense, meaning you’ll be able to trek through rocky places much easier without worrying about scratching. Breaks can happen though, so keep this in mind if you’re planning on wearing them a lot. 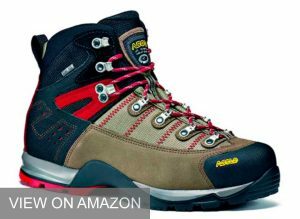 The Asolo Fugitive GTX resembles a traditional hiking boot, but have enough padding along the ankle and width areas to be used as a waterproof alternative. The shaft is much lower than the boots shown already, which is good for people who dislike the taller brands that cover a larger portion of the leg. The laces are big and will help you adjust the tightness well, but may tear quickly over time. It’s likely that you’ll need a replacement after wearing for a couple months. If you don’t mind this, then the GTX is suggested for casual hunter/hikers. The Salomon Quest 4D 2 GTX is a very stylish and flexible all-weather boot that won’t tire you down the same way that some of its competitors could do. Each boot could weigh anywhere from approximately 19 to 22 ounces each, so it’s great for people that have had pain in the feet occur with heavier or more rigid boots. Your feet won’t sweat, and the feel is confined by giving enough space to avoid moisture from developing inside. Recommended for anyone that dislikes bulky shoes of any kind. Sleek along the sides and very flexible, the Zamberlan 996 GT will block out moisture and provide you with sufficient room to walk outdoors for long stretches without getting tired. Padding is adequate and helps the feet stay at room temperature in both cold and warm climates. The smooth width area is also easy to clean but may leave visible marks after using in settings with lots of debris. Additionally, the tread area that’s close to the midsole could separate over time, so it’s best to use them when you’re not planning a hunting trip that won’t take place over several days. Coming in colors of brown and black, the Scarpa Kinesis Pro GTX is suitable for long hikes in areas where wet weather is expected. 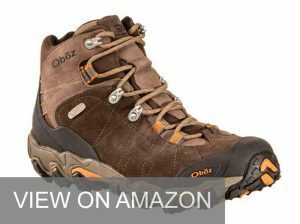 It laces up nice and gives the shoe a proper fit in both narrow and wide feet. But if your feet sweat a lot, this pair probably won’t perform well for you though, so if you are considering it as a purchase, try to keep your socks thin. Regardless, it scores high for anyone that anticipates hiking longer than hunting. 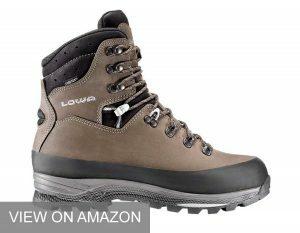 The Lowa Tibet GTX is a greenish-brown hiking boot with a great midsole, one that’s flexible and won’t become detached quickly. And if that’s not enough freedom of movement for you, simply adjust its laces to loosen up the shape (on the inside). You can also contour the feel by making them tighter. However, the biggest drawback is the steel toe in the front, which may peel when brushed against something dense, such as rocks. Knowing this, the Lowa Tibet is best for those who don’t own many pairs of boots and want something that can be worn casually but during infrequent hunting trips. The Oboz Bridger BDRY Boots flexibility with lightweight materials to produce a fit that’s perfect in areas with light rainfall. Your feet will not sweat, and the low shaft keeps your ankles in control when you need to walk, run, or sprint in the wilderness. The layout of the laces is a little odd though, and the thin material could be insufficient for anyone that needs heavy-duty boots in a winter environment. Still, they are great to bring alongside a stronger pair; something to slip on when you’re not in the mood for the heftier brands shown. Waterproof boots aren’t always easy to come by, mostly from the high number of low-quality brands that don’t completely protect the feet from the elements as good as claimed. You’ve probably used a pair like this before or had one that wore away too fast when worn in a wet environment. These type of boots are the same as any other, meaning that you should do your homework before you settle on one brand alone. Doing so could save you lots of time from having to administer a return when you should be concerned about your plans in the field. Read through the tips below to see what makes a good waterproof boot suitable for purchase, and what doesn’t. This is a factor that is often forgotten about when seeking new boot for the purpose of hunting. While it can be difficult to know what shape suits a wearer the best, many brands can have wildly different dimensions. As such, if your feet are big, the width area of the boot should be on the larger side. For example, if you notice a pair that has a huge shaft but gets tighter near the ankles, they could feel somewhat lacking in room. And then there’s the toe box. You’ll want to have ample room (but not too much!) near this area. When you’re comparing measurements, look for boots that have at least a half-inch of space in between your big toe and the front portion, or the area on the inside that’s layered with the plated steel toe. Since we are dealing with solely waterproof boots, materials also become important. What types do you prefer, and what is the ground like in the location in which the boots will see their greatest use? If you know the answers to these questions, you will have completed the hardest part of your shopping. 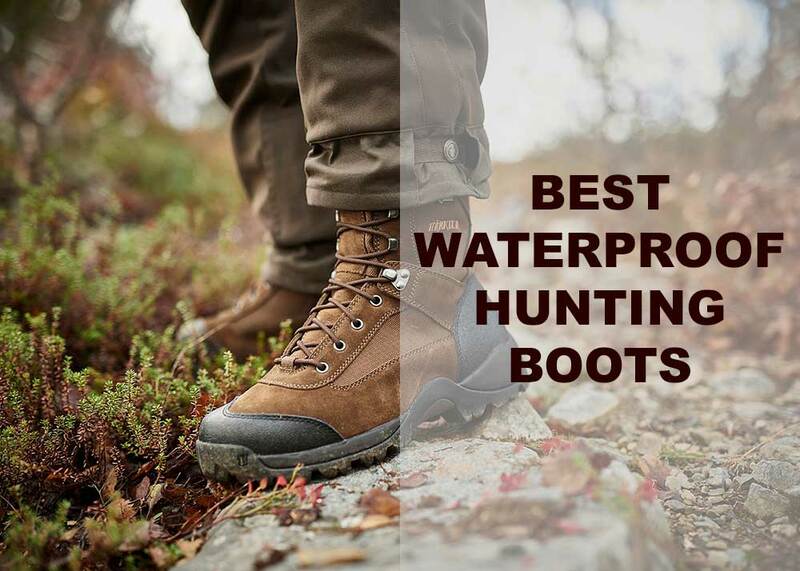 For those hunting such animals that require standing in shallow creeks or ponds, having something that can cover your entire feet is highly recommended. That means brands that make heavy use of polyurethane or leather may seep through the cracks and get into the inside, no matter how “water resistant” the boots are. But for just general hunting that will take place in rain or snow, those materials should suffice. To go more in-depth on the materials, many waterproof boots have either a combination of leather and fabric or a majority of both. For instance, you may have seen boots in the reviews that were completely rubber. 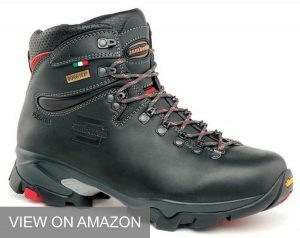 These are specialized to perform in the wettest weather possible, while also guarding against things like mud and ice. But they can also break very quickly with heavy use. Leather boots tend to make the water bead off, but sometimes absorb water in the material (especially near the tongue). They’re also a bit more tedious to clean, whereby dirt will stick to the surface much easier than their rubber counterparts. 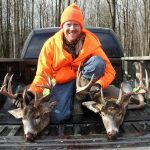 If you’re not sure on whether to get rubber or leather waterproof boots, consider the rubbers for hunting along bodies of water, or in the snow. The leather brands are outstanding in desert regions and temperate climates that don’t receive heavy precipitation. No boots are perfect. Each pair you come across will have its advantages and disadvantages. Some of the most common problems for weatherproof brands are breathability and weak treads. While waterproof doesn’t necessarily count as a boot being completely blocked from the air (when worn), the materials are often thicker than other boot categories. The treads can be strong but consist of lots of teeth and ridges, which increases the chances of breakage occurring when walking over rocks or other surfaces that are dense. Again, this doesn’t apply to all boots, but remember to choose by the amount of time you will spend wearing them. These issues tend to go away for people that won’t wear them very often, but increase when exposed to the ground on a daily basis. Waterproof in Hot or Cold Weather? Hunting in the winter season is sometimes tough. You not only have to deal with the water but ice and the dangers that poor boots can bring to your ankles from tripping. But hot climates have it no better. The warm weather can mix in salts and sediment from the ground that cling to the midsoles and treads, making them erode at a fast pace. If you’re planning a winter hunt, stick to boots that maintain a good temperature rating that won’t leave your feet cold. 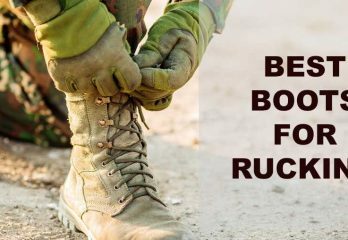 Hot, humid environments are better suited for boots with more flexibility and lacing systems. There’s more room to alter the shape for conformity to the air in the outdoors; you can choose how much air you want to let into the interior or blockage needed along the ankles. Some people sweat more than others, so if you see a pair of boots that you like but are afraid of discomfort from the material they’re made of, look for other attributes that could circumvent this. 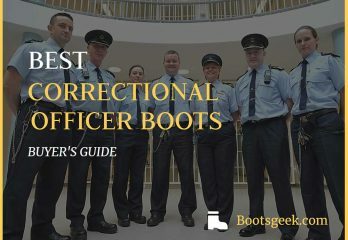 A good example is boots that form a strong width area but leave the ankles exposed, for better airflow into the boot near the top of the shaft. Furthermore, consider the soles as well. Some soles are antimicrobial and can prevent water from forming inside, reducing sweating and the odors that often result from it. Lastly, getting boots with either too much or too little arch support will make the inside feet too tight or loose, which could exasperate sweating from making your feet move too much or not at all. Tight shoes can definitely lead to unwanted moisture, so make sure that you’re getting the proper size boot for your feet. 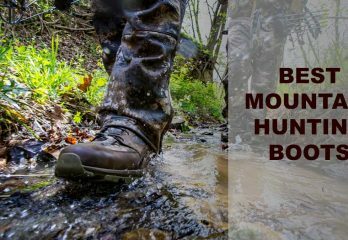 Having a great pair of waterproof boots can make hunting in bad weather fun, no matter how severe it gets. Comfortable feet equate to a healthier body when out in the field, and will take your mind off what you’re wearing and help you focus on the tasks at hand. 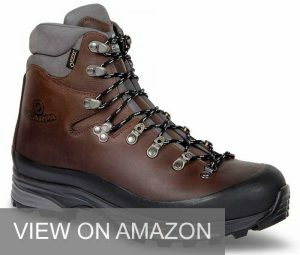 There are two pairs from the reviews above that manage to guarantee outstanding results, regardless of where you’ll be spending your time outside. 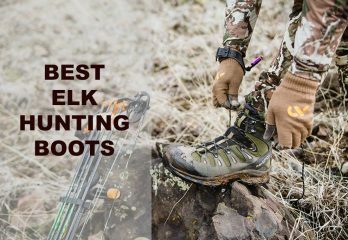 The Danner Pronghorn Realtree Xtra and Irish Setter 2875 Vaprtrek both maintain outstanding build, strong materials that shield the feet from water, and near-perfect shaft protection and flexibility. 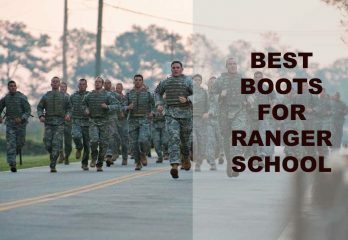 But before you finalize your search, don’t forget about the other eight boots, which may cater to specific preferences or regions more so than what’s available with the winning two. Still, even if you were to pick a random boot from the list for your next hunting trip, you will be satisfied with your purchase.